Are you looking for some of the best content on how to generate leads for your business? To make things interesting, I’ve personally evaluated and ranked the effectiveness of each of these 13 tips based on time, cost, effort, and the return you can expect, with a score of 1 – 5 (5 being the best). The traditional outbound sales route, such as going door-to-door and telemarketing, can be an effective way of bringing in new leads; provided you have the time to train up a dedicated sales team to do it for you – as, if you’re running a busy firm, you probably won’t have the time to do it yourself. However, with a team of trained staff, and actually going out there and speaking to people face-to-face, it will allow you to build on your business. The main downside to outbound sales is that buyer behaviour is changing, and people prefer not to be sold to, but rather go away and do research in their own time. It’s a good idea to also have some content and resources available on your website to back up what you’re saying and prove that you know your stuff – this helps earn trust early on. You probably already know that trade shows and networking events are essential if you want to get ahead and meet lots of handy new contacts and potential new business. However, far too many people go out there with a wallet full of business cards, a positive ‘go get ’em’ attitude, and then fail to follow up! Ensure you take down the email address and contact details of every new lead and contact that comes your way, so you can follow up with a courtesy email (or call) and also send them some valuable information and resources via email marketing (more about that below). The only downside to attending lots of trade shows and events is that it can take up a lot of your time and can be expensive. You have to weigh up whether a trade show is going to be worth your time, or whether that time might be better spent elsewhere. Email marketing can be an effective way of not only getting new leads, but also nurturing them into customers. For instance, if you were to start an email newsletter and introduced a form on your website asking for people to sign up, you could then send them regular email updates and practical tips. Remember, not all leads are ready to buy yet, so nurturing those leads with emails will also help them move further along their buyer’s journey at each stage of the process. For instance, you could use emails to address some of the key questions or concerns your new leads might have about your products or services. You could even preempt some of their challenges or pushbacks by sending them informative case studies which highlight how you’ve helped customers with similar issues in the past. For instance, if someone wanted a new home extension but was put off by the cost, you could explain how you helped overcome the issue. In order to do this effectively you really need to understand your buyer’s cycle – and don’t become a nuisance by sending too many emails close together! Otherwise you may end up in someone’s spam folder. Search engine optimisation (or SEO) is another good way to help drive more traffic to your website – as long as your website is set up for converting visitors into leads, that is! Otherwise, investing in SEO alone won’t have as much of an effort as you’d really expect. This sort of optimisation will help ensure your website is found by more people – and especially if you’re posting quality content on your blog using the same words and phrases your customers are regularly typing into Google naturally within your text, your traffic from search engines will start to increase over time. Some businesses can put too much emphasis on SEO, and can end up overstuffing their web pages and content with keywords, which looks unnatural and fortunately no longer fools Google. In fact, Google may punish you for doing so – and resorting to techniques such as link building you could even get you blacklisted! Most businesses these days can be found on LinkedIn, as it’s proven a useful tool to find lots of valuable new contacts and leads – so, if you’re on LinkedIn but aren’t really using it, think again. Like all social media, LinkedIn can soak up quite a bit of your time, so I’d advise to set aside a bit of time (10 – 20 minutes) every day to engage, post new content (if you have a blog), and keep your profile updated. Paid ads, or PPC (Pay Per Click) is where you pay Google (or other platforms such as LinkedIn,Facebook etc.) for an ad in a prime spot. It’s easy to set up: just specify your budget, and the length of your campaign, and proceed to watch as your money diminishes every time someone clicks on your ad. So, in an ideal world, the more you spend, the more traffic your website will get – and this can be quite effective as long as you’re only sending visitors to web pages that you know convert into leads. Otherwise, you might be wasting your marketing budget. You can also be quite precise with the people you attract, by using very specific target keywords that match exactly what your ideal customer (or buyer persona) is searching for. The more precise you get it, the better your chances are for acquiring new leads. But whatever you do, don’t end up using a very general keyword like ‘project management software’ and directing your visitors to your homepage – otherwise you’ll soon be wondering where all your money has gone! If you would like more help with Google paid ads why not read my guide on getting the best out of Google ads. Has your company done anything newsworthy recently? Press and public relations can be a fantastic way of getting more attention for your business. For instance, perhaps you’ve recently taken part in a community project, or are helping to raise money for a local charity with an upcoming fundraising event. Whatever the news, there’s a good chance your local newspaper may be interested, so draft out a press release and mark it ‘for immediate use’ – it should contain all the relevant details, including the who, the what, the where, the when, and the how. You can even add some choice quotes from yourself and anyone else involved. Next, compile a quick press list of local and online publications and Facebook pages who might be interested in publishing your release or writing a story of their own, and email it out to as many as possible. Don’t forget, you can always publish it on your own blog and Facebook page, even if it doesn’t get published elsewhere. Remember, this only really works when you have something particularly newsworthy to share, and occasionally you may spend time crafting what you think is an excellent press release, only for it not to be picked up by any news sources. In this day and age, you should be using social media to your full advantage – some of your competitors are! Perhaps you’ve already established a good online presence, including a professional Facebook and Google+ page (to go along with your Google My Business account). Other than that, you can also be testing out what works for you by being on platforms such as Twitter and Pinterest – you may be surprised the results you can get! Especially if you’re creating quality content you can share such as blogs, photos, infographics, videos and more. Of course, the amount of success you can get from any one platform will really depend on your buyer personas and where they’re most likely to hang out – for instance, if you’re trying to appeal to men in their fifties, Pinterest may not be the ideal start! However, a lot of construction businesses are using Pinterest to generate attention. Just remember that social media can easily soak up your time, so being on too many platforms at once may be counter-productive. My best advice would be to set yourself a specific time each day to interact on these channels, rather than going in and out of them all day. Let’s say, 30 minutes max! ForConstructionPros point out that if you’re a complete newbie to a lot of these platforms, there are endless litanies of free resources, including tutorials and webinars (such as this one on how to set up a Facebook business page) to help you get set up with a few key pointers. Direct mail is one of the most expensive ways to get new leads, however, that doesn’t mean it’s entirely ineffective. In fact, according to Forbes (via HubSpot), 18 to 34-year-olds actually prefer it! Despite that, knowing who to send to can be tricky, and blanket mailing in the hope that someone bites isn’t cost-effective. There’s also a right and a wrong way to do direct mail, and bombarding people with sales messages is no longer the way forward. Instead, fill your flyer or pamphlet with helpful resources and information that your ideal customer will benefit from – to get help with this, try answering the questions they ask you on a daily basis. Traditional advertising still has its place, and includes things like newspaper, television and local radio ads. Despite this still being a relatively effective way of bringing in new leads, these channels are taking up less and less of typical budgets, as more and more companies gravitate to online and paid ads. Unlike online ads, the success of traditional marketing is much more difficult to measure, as you can’t know for sure exactly where your leads are coming from, or for instance, what time of the day they heard your ad on the radio. And if you don’t know that, you can’t test and optimise your results. However, some businesses still use traditional advertising as it’s familiar, relatively easy to set up, and all you need to do is write your ad and pay a certain amount every month for as long as you want the ad to run – easy peasy. It’s also a sure-fire way of reaching a lot of people at once, but as I mentioned in a recent blog post about radio ads, you’re basically paying to send it out to EVERYONE and hoping that something sticks. This is less of a problem for more niche magazines etc., though. Becoming accredited through professional organisations and accreditation programmes means your firm can be easily found by potential prospects who are looking for specifically accredited businesses – you may even be included in extra online directories. Becoming accredited can bring you that extra level of authority, and it’s a badge you can proudly display on your website for visitors to see. However, becoming accredited can take time and may also include a subscription charge, so you have to weigh up whether it’s going to be worth it for your business. If you’re like most companies I talk to, the chances are that your customers DO research your services and products – even before they contact you. Perhaps you’ve even noticed that people seem to be a lot more informed about the type of materials you use etc. when you talk to them. That’s mainly because of a shift in buyer behaviour; people prefer to find out about what you’re offering in their own time! And where’s the best possible place they could be doing that research? On your website, of course – preferably on your blog. Of course, sitting down and writing blog posts can take up time, but it can pay off dramatically. According to Zomalo, businesses that incorporate a blog as part of their overall marketing strategy see 67% more leads than those which don’t – as well as 55% more website visits. Think of all the questions your customers ask you on a daily basis – it’s your job to provide answers to those questions in the form of helpful, quality content marketing that’s NOT trying to sell! This helps establish trust early on with potential customers, and is a great way of acquiring new leads. Which materials will be used? What are the common problems with this solution? The content you create can come in various forms, from practical blogs and colourful infographics, to informative videos and fun slideshares – as long as you’re speaking their language and giving them the answers they really want to know. Updated your blog regularly (2 – 3 times a week) with fresh content. Now we’ve gone over some of the common methods you can use to help you generate more leads, let me introduce you the greater methodology that is inbound marketing. 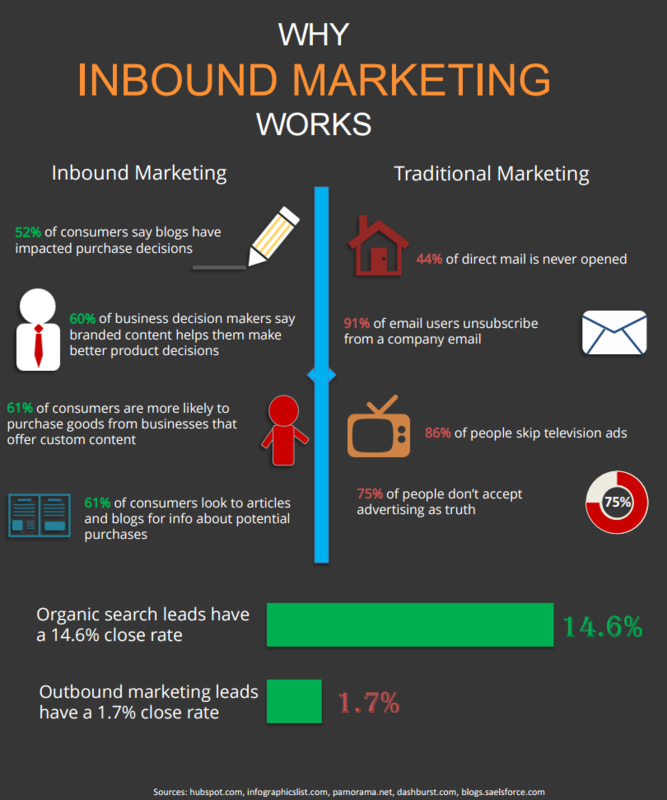 Inbound marketing is a tried and tested marketing method that works across most industries and business models, including yours. It’s essentially a way of taking your offline sales process (which you know works) and adapting it to the digital age. For instance, did you know that 54% more leads are generated by inbound tactics than can you expect from traditional paid marketing? It’s perfect if your customers have a lot of questions before they buy from you, as this usually means they do quite a bit of research before they make any kind of purchase decision. Taking the time to explore all their options probably means that your sales process is perhaps weeks – or even months – long, in a lot of cases. However, by answering their biggest questions and providing them with all the answers and helpful information they need, you can shorten that sales process. Inbound marketing can yield particularly good results for B2Bs (business-to-business), however, it can also work well if you’re a B2C (business-to-customer), as one of my clients soon discovered. John Carmichael from Edinburgh-based heating company Superwarm Services has gone from strength-to-strength with inbound marketing – in fact, we published a blog a while back on how he had managed to increase his sales by 187% from inbound alone! The graph below shows how John’s leads have now hit the same level now as when he was paying £4,000 towards PPC (paid ads) the same time last year. That’s pretty impressive when you consider that inbound will pay off for years after putting in the work, whereas the leads you gain from PPC simply cease to come in the second you cancel your account; that’s what’s known as compound interest, and it’ll continue to build. TIP: For a fully comprehensive guide to inbound marketing, read our beginners’ blog on the subject. Are you curious about anything we’ve mentioned on this list? If you’d like some specific advice or have any questions we haven’t answered yet, leave a comment below and I’ll answer you as soon as I can!